A new web-based, plug-in application created by two Hope students gives those with learning disabilities the means to read online articles at a level that best suits their reading comprehension. The app, called Articulus (meaning “article” in Latin), allows for greater reading understanding and success in school and life. 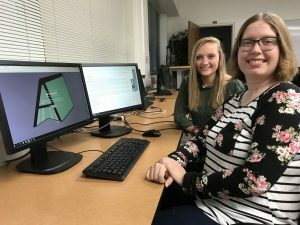 Senior Amber Carnahan and sophomore Jori Gelbaugh, under the supervision of Hope professor, Dr. Michael Jipping, professor of computer science, developed the program during the summer of 2017. 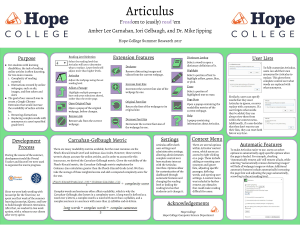 Though currently and primarily in use at Black River School in Holland, as a Chrome extension, Articulus is also available to anyone, free, in the Google Chrome Web store. Senior Amber Carnahan (right) and sophomore Jori Gelbaugh (left) created the app, Articulus, under the supervision of Dr. Michael Jipping, professor of computer science. And it all got started because of a conversation in a grocery store aisle. So Jipping made the project a priority for the Hope Software Institute (HSI). A software development arm of the Department of Computer Science, HSI gives experience to Hope students who are interested in pursuing careers in the software industry while delivering applications to real clients, usually a non-profit organization that could not afford a professional developer. They wrote code in Java Script and designed the app in regard to its features, aesthetics, and usability. Carnahan, a computer science and English double major, and Gelbaugh, a computer science and international studies double major, were hired by Jipping (yes, HSI pays its student workers!) to tackle the complex work of learning a new programming language to make the English language less complicated. Over the course of the nine-week project, they learned to write code in Java Script and determined how that code interfaced with Chrome and Chrome extensions. They also designed the app in regard to its features, aesthetics, and usability. All of that, though, needed to precursor, a run-up to understanding how reading levels are measured and thus can be changed. Dr. Pardo also encouraged the two students to not just consider word and sentence complexity but also visual distractions that can be prevalent on web pages. Besides working with closely with Dr. Jipping and Dr. Pardo, Carnahan and Gelbaugh also meet with their Black River clients every two weeks to discuss the app’s progress. From prototype to the (mostly) finished project, the feedback has been positive, says Jipping. And not only from Black River. The 2017 Consortium for Computing Sciences in Colleges (CCSC) Midwest was also impressed. At their recent 2017 conference, CCCS honored Carnahan, Gelbaugh, and Jipping with the best poster award. Though there are some changes the group would still like to make to the app, for the most part, they are happy with what they created for both technical and humanitarian reasons. Both student developers are delighted they were able to create something that helps others in meaningful, educational ways. Their product tagline — The Freedom to (Easily) Reading ‘Em — sums up what they wanted Articulus to do best.